I hadn’t been to the park by my parents’ house in a really long time. I drive by it whenever I visit my mom and dad, but I don’t look at it out the window. The last time I was there was well over 16 months ago. Yesterday, Annabel was finally old enough to do one of her sister’s favorite things – swing. The first time Maddie went on a swing, it was at the park by my parents’ house. So, to the park we went. I placed her in the swing next to the one her sister sat in. And just like her sister before her, Annie loved swinging. I busied myself taking photos, but when I felt overwhelmed by the past I pushed my present. And then, when that wasn’t enough, I wrapped my arms around her and we flew together. fly up in the sky where the world looks little. we’ll fly up in the sky where the world looks little. we’re gonna be warmed by the sunshine’s love. out in the big wide open sky. best friends forever you and I. As we left, I let myself imagine, for a brief moment, what it would have been like if Madeline had been there. I would have pushed them both, Annie gently while Maddie yelled “higher mama higher!” And then I would have chased Maddie all over the playground, up ladders and down slides, until it was time to go home for dinner. I closed my eyes and imagined them both laughing. It is a beautiful, heartbreaking sound. i can hear it too, heather. and it is beautiful. I wish so much she could be there physically but I’m confident that she was there somehow, giggling away. Thank you for writing about her! I love, love, love the entries about Miss Annie and the funny adventures recently and am so glad for them. But reading about Madeline brightens my day in a different way, because as horribly sad as I am for you and Mike over her passing, she was such a bundle of life and love, it’s hard not to smile when I think about your adventures with her. Wishing you and Mike and your three daughters (one of them is Rigby) all the best. The last sentence summed it up. Heather, you have a beautiful heart, to match your beautiful daughters. And I love, love, love Annie’s chubby features. I’d love to squeeze that girl one day. You are trying so hard…. What joy on their faces. Beautiful and heartbreaking. I don’t know how you do it; capture the precise, exquisite pain of Maddie’s absence even as well all trod onward, looking back for her at every chance. You are a beautiful soul; a seasoned and wise mother. You are a jewel of a friend and a shining example of a good person. An army of us stands with you and listens to the beautiful, aching silence tonight. Love to you, Mike, Annie & Rigby and Maddie, sweet Maddie, as always. I would have written my own comment, but Kristen summed it all up so poignantly and spot-on. I sit here weeping and completely grateful to have the chance to peek in on your family journey on occasion… So different from my own, yet so resonant all the same. Heather, you are remarkable. Thank you. Yep, I feel the same. Oh Heather, you can still make cry. Lots of love. Your strength is admirable. Your daughters are so beautiful. Your words pulled on my heart so much. Lots of hugs mama. Thank you! Seeing those two beautiful, mouth-wide-open smiles made my morning! As always, sending a virtual hug your way. So beautiful, so filled with love. Annabel couldn’t have a better mother. Sweet and bitter tears, yet so glad you share. Oh, Heather. All I can offer you is a listening ear and love. Heart-hurt and smiles mixed together for you. There is such a double meaning to ” I push my present”. She is your “now” and your “gift”. Your girls are both so beautiful. What a beautiful post! LOL their expressions are the same! and in a couple years, maddie would be the one pushing annie. i wish so much that the three of you could enjoy that. annie’s gonna have to enjoy the crap out of that park, for maddie too. Oh Heather, beautiful and heartbreaking says it all. Beautiful words. Beautiful post. Priceless photos. Those Spohr girls laugh with their whole body – so much gusto! I wish it were the way it should be, too. Beautifullly written post and songs. “…when I felt overwhelmed by the past, I pushed my present.” You are an inspiration to me. I have to agree with these two ladies on writing that line. You truly are an inspiration to others. Both your girls are beautiful. Not surprised Annie likes the swings just like Maddie. The Spohr girls are made of adventurous, brave stuff. So beautiful!!! So happy Annie loves the swings as much as her BIG sister did! I love that picture of Madeline, it is one of my favorites. She just radiates happiness. I also love the line “I pushed my present”, heartbreaking and hopeful at the same time. Annabel looks like she had a blast. She is a lucky girl to have such wonderful parents. I think that’s the toughest part is thinking about how they both would be playing together. Xavier is going to be 3 next month and I always wonder how things would be if his 5 year old brother would be around. Is something I would give any amount of money to see, but for now is just some thing I will see in my mind. Beautiful and so sad all at the same time. Annabelle is beautiful. I was doing almost OK until I got to the song you sing for Annie. I wish all little girls could have mommies who love them and sing to them just like you do for your girls. Thery are both so beautiful. My heart aches thinking of that sound. I know Maddie is is laughing along with Annie. Wow, the open-mouth smiles are pure joy of both Maddie and Annie. Annie’s smile and her little button nose match Maddie’s for sure. They are definitely sisters! Maddie was there with you, sitting on a flower or fluffing around in the clouds above you. She saw you both and was giggling along with you, I just know she was….. I hope you are always able to do that, Heather! You are SO STRONG and so amazing. Beautiful pics!!!! I just love the way you love your girls. Beautiful post. I’m glad Annie had a great time swinging, just like her big sis. So beautiful, so touching. Thinking of you and your gorgeous girls today. This is such a beautiful post! So sad and so happy all at once. I love seeing the photos of each girl playing on the swing. They both look like they were having soooooo much fun! yet so different at the same time. the other in her mama’s arms. the sun is bright, smiles are joyful and heart breaking at the same time. and I… I sit wish and weep. What beautiful words! And so very true. You’re so brave and such a good mama for taking Annie to the park. I remember the pictures of Maddie in the swing and love seeing Annie there too. You are so brave and strong. Annie is so lucky to have you as a mom. And Maddie too, of course. I love seeing those sister-faces. I wish they could swing side by side. Sending so much love to you and yours. Beautiful. I love how both girls have the same expression! on the swings. I know Maddie was right there watching her baby sister swinging! Over whelmed with tears, and so heart breaking that you got those moments with Maddie taken away. It just breaks my heart!! I love the pitures of you and Annie swinging, she has such a big smile!! A beautiful tribute to both of your daughters. Thank you so much for sharing with us. This is lovely Heather. While it is so not fair that Maddie is not hear physically, I am confident that she was there swinging next to her little sister, giggline. Sending you lots of hugs! It has all been said today… I can only repeat. Maddie and Annabel have the same smile! Very touching. Wow, was that poetically beautiful. Such a sweet post. When I looked at the pics, I was thinking that if Maddie had the same chub-a-lub that Annabel has, they’d probably be pretty close to identical (well, except for their skin tone). Your strength amazes me. I think I would have been a wreck. You are a wonderful mom to push through for Annie. oh, this is so beautiful. hugs for you and yours as you continue through this journey. Those smiles, they slay me. Such beautiful girls, Heather. 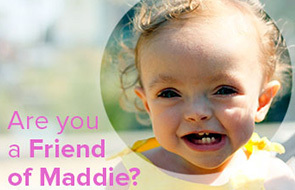 As hard as it must be to write, I too love your posts that include Maddie. I haven’t stopped thinking about her since the moment I found your blog and her spirit still comes through in your writing and photos. And that little Annabel…she just seems like the life of party. I don’t even know what to say. I wish I could give you a hug. Well, hadn’t cried in a while reading your blog, but did today. Still, I am so happy for your “present.” I know what you’ll be dealing with on that date in early September and just know that no one will ever forget Maddie. Was wearing my March for Maddie shirt the other day, just around the house, and my Meredith, now 19 months old, kept asking me, “What’s that? What’s that?” and pointing at my shirt. I told her “Maddie,” and though she hasn’t repeated it, I just wanted you to know that Maddie is being talked about and loved, even by those who never met her. WOW. I am so overwhelmed with emotion. How do you do it? Oh their smiles are the same. What a joy your little girls are. When I read the captions: amazing Annabel, famous Madeline, I promised myself I would not cry, but here I am doing just that. Then I look at pictures of your smiling daughters and feel hope and warmth. A million hugs to you girls. Of course this entry makes me want to cry. I wish Maddie was there with you. I love the similiar photos of Maddie and little sister Annie laughing with delight on the swing. So awesome that you have so many photos of Maddie to share with Annie. I don’t know what else to say. I just want to cry. Madeline was just so very beautiful. This post is so beautiful. I love the pictures of both your beautiful girls! It was good seeing a picture of Maddie, it had been a while It was also good seeing a pic with you with Annie. Such beautiful girls, all three of you. Beautiful photos, beautiful post. Although the last sentence made me burst into tears for you. I love those huge beautiful smiles. At first I was going to comment that your two girls shared the same smile, but looking at the bottom picture, all three of you do! what a beautiful post and what beautiful pictures.. It brought tears to my eyes. The pictures of both girls, the similarities of their features. And like a few said here already, Maddie was there. She was swinging right next to her sister. Sometimes I don’t know what to say but I want you to know I’m thinking about you. Bittersweet but beautiful post, thank you for sharing. What a beautiful post. Thank you for sharing your joy and your pain with us. so adorable, those two little girls with their open mouthed smiles. you are blessed to be their mama. It’s been a while since I’ve cried reading your blog, but going from Annabel’s wide, gummy smile to the nearly identical gummy smile of sweet Maddie got me. crying… i miss my niece… i love her. did you know that her holiday card is up on my fridge in israel? i can never remove it. love you. I think of you guys at the strangest times. I just caught this in my reader but had remembered this photo of Maddie (or one like it) when I took a friend’s baby to the park over the weekend. This was a beautiful post.